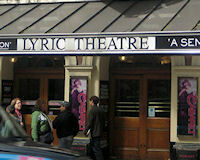 The Lyric Theatre, oldest on Shaftesbury Avenue. Description: The Lyric Theatre was designed by architect CJ Phipps for the producer Henry Leslie using grand profits from the Alfred Cellier and BC Stephenson hit, Dorothy. He moved this show here from the Prince of Wales Theatre on the 17th December 1888. It's early days saw it stage mostly comic operas, and then light comedies, musicals and straight dramas. The theatre is one of the few to still use water to hydraulically operate its iron curtain. Rising Damp legend Leonard Rossiter died here from hypertrophic cardiomyopathy in 1984 while waiting to go onstage, where he was performing in Joe Orton's play Loot.